Ramen Santouka has been my all time favorite ramen bar - no matter it's in Singapore or USA, I always long to eat Ramen Santouka. Ramen Santouka is originally from the city of Asahikawa in Hokkaido, but it serves not the Asahikawa nor Sapporo style ramen, but the Hakata style ramen. 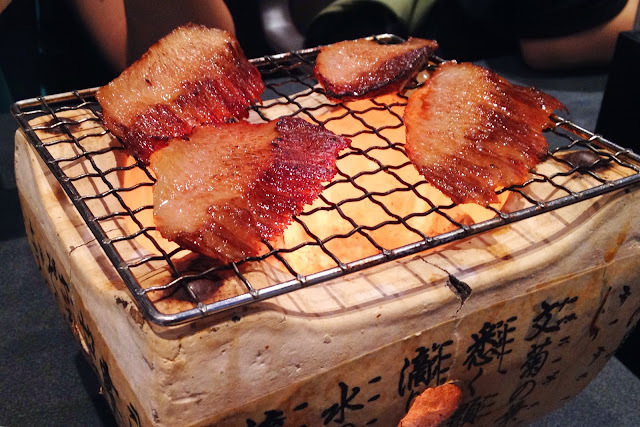 There are three main broth types served: Shio (salt), Shoyu (soy sauce), and Miso (soy bean paste). 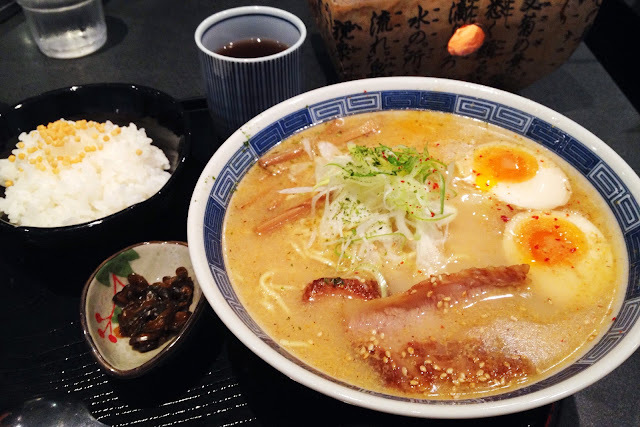 The Shio ramen would be the traditional Tonkotsu broth Hakata ramen. 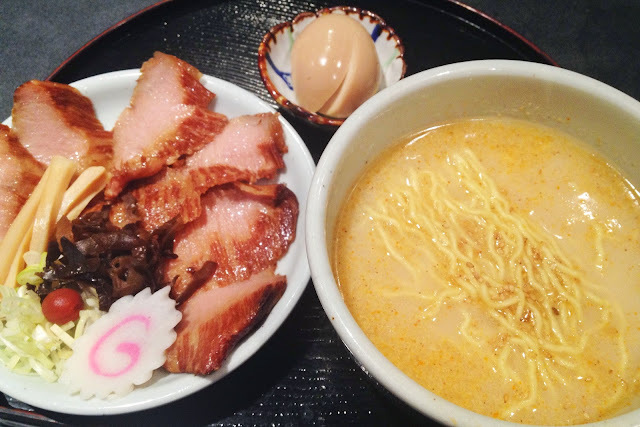 In addition to the delicious soup broth and noodle consistency, Ramen Santouka is popular for its Tokusen Toroniku (pork cheek meat), that is deemed to be the most tender part of pork and is very soft and delicious. When you dine at Santouka, ordering ramen that comes with Tokusen Toroniku is a must. Otherwise, you may also order a bowl of regular ramen with charsu and order Tokusen Toroniku (normal or char-grilled) as a side. My favorite Ramen broth at Santouka would be the Awase Aji, which is a combination of all three broth: shio, shoyu, and miso. If you order the Awase Aji ramen, it comes in a set that consists of a bowl of ramen with charsu, a bowl of rice, an ajitsuke tamago, and a cup of tea. I love the taste of the broth, and after you finish the noodle, you can eat the rice together with the remaining ramen broth. 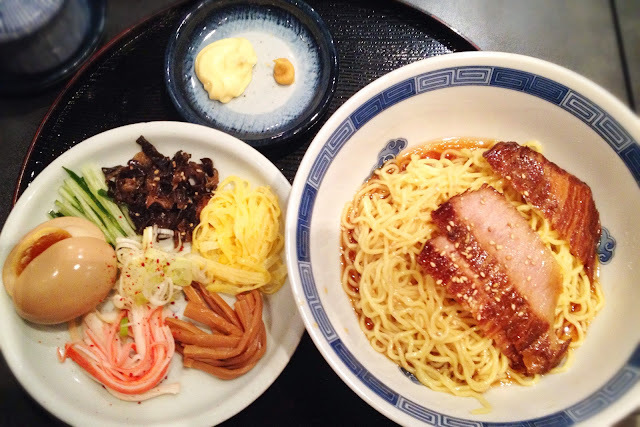 This would be the dish that I always order at Ramen Santouka. My next favorite ramen broth would be the Shio. Usually I would order a small (S) size Tokusen Toroniku Shio Ramen, with an additional ajitsuke tamago. If you are bored with the traditional and common ramen types, you might be interested to order the Hiyashi Chuka, which is the Japanese cold noodle that is typically served during the summer. The Hiyashi Chuka is served with a few slices of Tokusen Toroniku. I would say that the Hiyashi Chuka at Ramen Santouka is not the best. The soy dressing was too salty and too sour than my liking. The acid could have been reduced and the sweetness could have been increased. Other than that, the toppings and ramen noodle were good. I love Ramen Santouka as the broth was perfect. It was perfectly seasoned - not too salty, and just the right amount of umami. What's more important? It's lighter than the typical tonkotsu broth (say at Ramen Keisuke Tonkotsu King), which I prefer. The consistency of the noodle was great too. The charsu? They are as good as the Tokusen Toroniku so you could actually choose which meat to eat according to your mood. Perhaps the only downside of Ramen Santouka is their ajitsuke tamago. I found the tamago slightly overcooked and too sour (I wonder where the acid kicked in) - and the taste is consistent in my many visits. Overall, Ramen Santouka is my favorite Ramen bar and has always been my go to Ramen eating place.